Honorable mention. Shortly after the launch of the Huawei P8, the manufacturer offers another device with similar specifications, now under the label of its subsidiary Honor. Unlike the P8, the Honor 7 is not focused on a slim construction, but tries to attract customers with a higher battery capacity. Our review reveals if this is a success. Honor has once again impressed us with a flagship smartphone at an outrageous price. For under £250 you get a lot of phone for your money. Performance is good with the main camera and fingerprint sensors being the highlights on the hardware side. Emotion UI isn't our favourite Android skin but it's perfectly usable and you can always change it if you like. A trip down London’s Brick Lane introduced me to a new smartphone from Huawei’s Honor range. Following the release of its top-of-the-range P8 smartphone, Huawei has now refreshed its Honor range which is aimed more at the budget section of the market. The Honor 7 is a 5.2-inch smartphone that comes with the tag line of “For The Brave”. For all that, though, the Honor 7 is a grower. Quirky software means some of you may not like it too much on day one. However, give it a tweak or two and by day three you’ll love the thing. Not to mention have an extra up-to-£150 left in your pocket saved over buying one of the big-brand flagships to spend on sweets. The Honor 7 is one more addition to my argument that you don’t need to spend more than Rs. 25,000 to own a great smartphone. It has an impressive, sturdy design, a great camera, swift fingerprint sensor, and a UI that is a refreshing change from the stock Android-driven smartphones out there, and it really gets the job done well. If you have a budget of Rs. 25,000 and are looking for a smartphone, then the Honor 7 can definitely be at the top of your list. Huawei has used its Honor range to successfully market quality products at competitive prices for a while now, and the online-exclusive strategy has resulted in some success. The Honor 7 is a beautiful device that embodies everything that a flagship smartphone should be. It has the right specifications, great features that will force you to question the value of competing devices, and a truly premium look and feel. Given its price of 350 euro (roughly $400) unlocked, the honor 7 is still an okay smartphone, but there are at least several alternatives that spring to mind right away. The Moto X Play, for example, costs about the same, all while delivering great battery life and running a near-stock, bloat-free version of Android. There’s also the Asus ZenFone 2, which may be a bit plasticky, but it delivers smooth performance and costs considerably less. If you don’t mind spending a few extra bucks, there’s also the LG G4 with its fast processor, QHD display, and very capable camera. “Value for money” is a phrase that is sometimes overused, but here it really does apply. This is a phone I’ve used as my daily driver for quite some time now and, I have to say, I really like it. The handset has some neat features such as Signal+ for switching between masts quickly and that clever app monitoring system which does indeed increase battery life, improve performance and keeps the phone running like it should. The motion controls, which let you rearrange icons by shaking the device or to move icons by tilting the device, they’re really good. It’ll let you flip the phone over to mute, make calls by raising the phone your ear and you can draw gestures to open an app. All said and done the Honor 7 is a premium metal-bodied smartphone packed with high-end features and an impressive build quality. For everyone out there who wants a flagship smartphone but doesn't want to spend too much money, the Honor 7 could be a strong option. Huawei has done a decent job by offering a wide range of features in a single package. The Honor 7 has all the makings of a great mid-range smartphone, but concerns over its build quality, its frustrating version of Android and terrible battery life means it can't help but fall short of its goals. At this price, the £270 Motorola Moto X Play is much better value if you can't get hold of an invite for the OnePlus 2, but if you'd rather save some money, the £200 Sony Xperia M4 Aqua is an excellent alternative. The Honor 7 is a solid handset with a useful fingerprint scanner, and it gives you plenty of bang for your buck - and it feels a whole lot more premium that it actually is. The lack of NFC is annoying and EMUI can get in the way, but if you're willing to look past these nuances, for a SIM-free handset, £250 is a steal for a phone that doesn't cut too many corners. At £250 the Honor 7 packs the kind of specs you’d expect to stay competitive, along with some solid features like a fingerprint scanner. That hardware is solid and refreshingly attractive, but the software side often lets it down, with Emotion UI proving rather sketchy in areas despite throwing in lots of handy features too. The Honor 7 is a well-built smartphone that offers great value for money. However, its heavy Android skin and lower than average battery life diminish its overall appeal. While it will meet most buyers’ needs, people interested in a great-value smartphone would do well to consider the OnePlus 2 – which targets the same market, has a better design and offers superior performance and battery life. Wer auf der Suche nach einem hochwertig verarbeiteten Dual-SIM-Smartphone mit Fingerabdruckscanner und technischer Oberklasse-Ausstattung ist, kann ohne Bedenken auf das Honor 7 zurückgreifen, da das Honor 7 keine wirklich vernichtenden Kritikpunkte besitzt. Das Design mag vielleicht nicht überraschen und auch die Akkulaufzeit ist bei anderen Modellen noch etwas besser. The Ascend Mate 7 is without a doubt one of the most premium smartphones Huawei has ever released and the Honor 7 aims to continue this, with a new improved build, additional features and a much better camera in a smaller, more manageable body. Yes, the software is arguably more complete on the Mate 7 but while it’s not perfect, it is certainly more than manageable on the Honor 7. With a strong battery, solid construction and its clever sensor swipes – giving a big boost to bog-standard Android's usability – the Honor 7 casts a long shadow in this price range. The only comparable phone with top range features in the £200s (SIM free) is the OnePlus Two, although the comparison is more theoretical than practical. Despite the foibles of Emotion UI, the Honor 7 is definitely worth a look by consumers and enterprise buyers. The sturdy design and lengthy battery life make it a great everyday smartphone, and it achieves a level of performance we'd expect to see on far more expensive devices. The inclusion of a fingerprint reader, 20-megapixel camera and an infrared transmitter for this sort of cash is unheard of. It has a higher resolution screen than the Moto G too. Plus, if you get in early, there’s a generous 50 euro discount, bringing the price down even lower. Honor could be onto a real winner here. In an attempt to take on the new higher-quality mid-range, Honor has improved upon its first and second handset releases for its latest flagship. All in, that makes the Honor 7 impressive. From the build quality, to the performance, battery life and camera options. If anything it further squishes the Huawei P8's potential, which seems odd from a sister company. There are a few flaws and niggles with the Honor 7, most notably with its irritating Android skin, but even this can’t dampen our enthusiasm for what is a remarkably good value Android phone. We’d normally expect to pay at least twice as much for a smartphone with similar features and responsiveness making the Honor 7 a real bargain. Overall the Honor 7 is a decent mid-range smartphone with some lofty aims – some of which it nobly fails to achieve. Sadly, a fail is a fail regardless of how noble it may be, so despite its promise there isn't quite enough to make the Honor 7 stand out from the crowd – something that Huawei needs it to do if it's to make it big in the west. While the Honor 7 targets a competitive segment of the smartphone market, if my opening impressions are anything to go by, it’s definitely got the chops to carve its own space. Featuring a premium metal design, the Honor 7 is chocker-block full of top end components – even when compared to its main competitors the OnePlus 2 and Moto X Play. Given that I only had a day to try out the Honor 7, making this more of a ‘preview’ than a ‘review’, I can’t evaluate battery life. However, there’s a meaty 3100 mAh cell inside, and Honor says it supports ‘Fast charging’. Which may or may not be the same as Qualcomm’s standard, we’ll need retail hardware and chargers to check that. I was also impressed by how cool the Honor 7 stayed, given the octacore chipset and the issues the high end Snapdragons have been having. All that metal helps and, apparently, there’s special heat dissipation engineering inside. There’s no denying that Huawei’s Honor brand has made somewhat of a splash on the market by offering a premium experience at an affordable price and the Honor 7 is certainly no different. The key thing however is that with the Honor 7, Huawei has made less trade-offs and offers both a premium build and a premium experience at an incredibly affordable price tag. So there you have it for this in-depth look at the Huawei Honor 7! Overall, the Honor 7 is a really good phone, with its beautiful display, impressive battery life, a fantastic fingerprint scanner, and good camera. Performance is smooth and snappy for the most part, save for the most graphically-intensive of games, and while the Huawei’s take on Android can take some getting used to, the slew of shortcuts and gestures available enable a good experience. There are some really good options available out there in this price range though, such as the top version of the ASUS Zenfone 2, the Axon Phone by ZTE, and the Moto X Play, which you might want to consider instead. At the end of our review, we can't help but feel a little confused. Was the Honor 7 the right thing to do? This isn't about the phone's pros and cons, mind you. It just feels odd that the Honor 7 is so similar to the Huawei P8 - and in some ways obviously better. Unless these two are exclusive to different markets, which is quite likely, there is no point getting the P8, is there? And that's as good a compliment as they get for the Honor 7. Wu Dezhou, Huawei's Director of Product Line for Honor, said that the Honor 7 targets 3 main DNA characteristics: quality, battery life, and signal. And in most cases, Huawei was able to deliver. The build quality of the smartphone is definitely something you'd expect from a top tier device and shatters any preconceived notion about Chinese-made smartphones. Although they could have thrown in a fast charger in the package, the 3,100 mAh battery isn't half bad and is one of the biggest in the market. Huawei's use of two cellular antennae is also rather ingenious. And the fingerprint scanner? Definitely something to look for in other high-end smartphones. Mittelklasse-Preis und trotzdem fast High-End? Model: The Honor 7 comes with a 20 MP rear camera and 8 MP front camera. Its panorama mode enables excellent landscape shots with its scratch resistant sapphire lens. The front camera has a soft front light for capturing better and brighter selfies. There are also 10 levels of beauty mode settings and this makes taking perfect pictures such a breeze. The 5.2 inch HD display has been optimized for low power consumption and it is encased in a solid, high quality aluminium body. Although the display is 1080 x 1920 pixels unlike other high end models which come with QHD displays, this is pretty reasonable for the price range. Beneath the camera on the back of the phone is a fingerprint sensor which is positioned exactly where the index finger naturally sits when picking up the phone, requiring very little effort to use it. Furthermore it works well with wet or sweaty fingers. The CPU powering this device is a Quad-core 2.2 GHz Cortex-A53 & quad-core 1.5 GHz Cortex-A53. 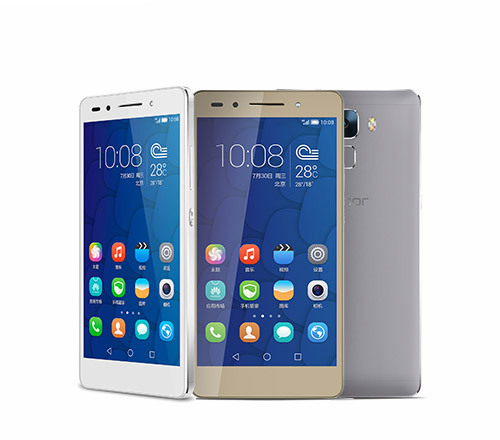 The Honor 7 supports dual SIM. However, one of the SIMs only uses the slow 2G network and you sacrifice microSD card expansion, if you want to run a second SIM. Still, it's nice to have a dual-SIM phone. The Lithium-Polymer battery rated at 3100 mAh lasts 8h and 20 min of talktime and up to 250 h in standby mode. Kirin 935: ARM based octa core SoC (4x Cortex-A53e up to 2.2 GHz and 4x Cortex A53 up to 1.5 GHz). » Further information can be found in our Comparison of Mobile Processsors. 81.3%: This rating should be considered to be average. This is because the proportion of notebooks which have a higher rating is approximately equal to the proportion which have a lower rating.